Learn to Draw in a Matter of Weeks? Is it possible for someone to learn to draw in a short period of time? More specifically, can one learn to draw well in a matter of weeks? Dr. Betty Edwards would say, without hesitation, yes. Can a Book Quickly Teach Someone to Draw? 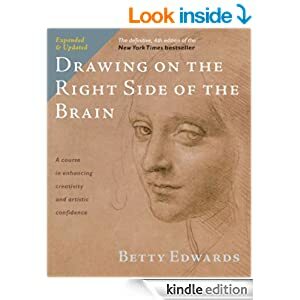 In the 1970‘s, Edwards authored a booked titled Drawing on the Right Side of the Brain. Since the book’s release in 1979, it has sold over 2.5 million copies. The book’s popularity is due largely to the fact that its exercises garner results that any aspiring artist craves: the quick acquisition of skills necessary to draw beautifully. Because the right brain thinks in patterns and pictures and is non-verbal, it makes sense that primarily using that side of the brain when learning to draw would increase the chances of successfully gaining artistic skills. This exercise “helps put the left side (of the brain) to sleep and exercises the right side.” It’s important not think in words while practicing this. Using this technique is a first step you can take to begin to get your right brain accustomed to being used somewhat independently of your left brain. This creates an ideal mental environment for learning to draw. Besides her book, Dr. Edwards also offers other materials that foster right-brained learning of artistic skills. These resources include DVDs, workshops, and more. Are you a natural when it comes to drawing? If not, have you always wanted to learn to draw? Has intimidation discouraged you from trying? Share with us in the comments box below.